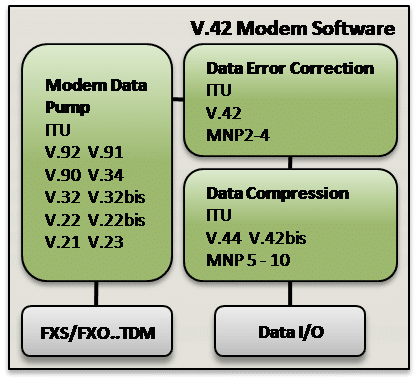 V.42 / V.42bis software implements the ITU-T V.42 error correction protocols including MNP2-4, MNP5, and MNP10 data protocols. In addition, both LAPM (Link Access Procedure for Modems) and an alternate protocol are supported. The alternate, as described by V.42, is the MNP (Microcom Networking Protocol) data protocol, classes 2 through 4. LAPM and MNP2-4 implement end-to-end error correction through an automatic repeat-transmission request algorithm. Contact us to discuss your modem application requirements. VOCAL’s V.42 / V.42bis modem software is optimized for performance on leading DSP architectures and processors from TI, Intel, ADI, AMD and other vendors. Our V.42 software may be licensed standalone, as a library or part of complete design. Custom solutions are also available. VOCAL’s modem protocols provide software developers a compression capability with ITU-T V.42bis and MNP5 algorithms. The V.42bis data compression protocol is sometimes used standalone. Classically, V.42bis has been used with LAPM and MNP5 is used with classes 2-4. MNP2 is an error correction algorithm using data packets of asynchronous characters over a full-duplex modulation while MNP3 introduced the use of HDLC based synchronous packets. MNP4 can be used with or without the class 3 protocol feature; it provides for the use of slightly smaller (through optimized headers) data and acknowledge packets. VOCAL’s Overall Modem Controller (OMC) Layer provides coordinated data modulation/protocol operation relative to startup, shutdown, modulation retrains and modulation renegotiations. System configuration supports the overlay of LAPM, MNP 2-4, Buffered and Direct Modes for maximum program and memory efficiency. System configuration supports the overlay of V.42bis and MNP5 for maximum program and data memory efficiency. System configuration supports the overlay of data protocols with fax protocols for maximum program and data memory efficiency. System configuration supports compile-time selectable V.42bis dictionary size and string size. Compatible with ITU and Bell data modulations through V.90 (also available from VOCAL). VOCAL’s optimized software is available for the following platforms. Please contact us for specific V.42 and V.42bis supported platforms.